Paul seems to indicate that the Christian life is supposed to be one that’s filled with praise for our Creator. This wasn’t supposed to be a one-time, hour-out-of-the-week sort of event. No, notice the always. This was the constant, the baseline, the expected status quo. And let’s be honest, we have problems with that expectation at times. Rejoice always? Really? That’s a tall order. I don’t know if I can manufacture those kinds of feelings 24/7. What happens if I’ve had a bad day or week or month? What if my life has been one long string of disappointments and hurtful experiences? 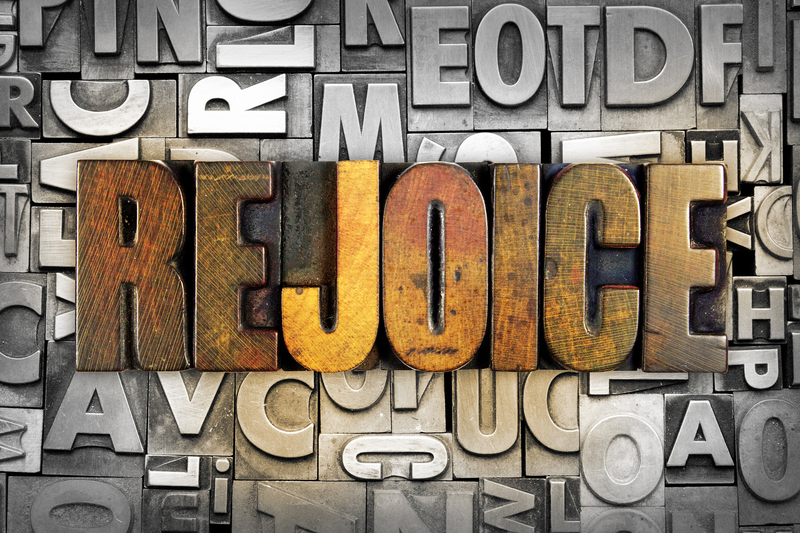 How can I really be expected to make rejoicing what I do, a constant part of my life? It does seem like a tall order, doesn’t it? But I think it’s instructive to remember where Paul was when he wrote this piece of advice. In Philippians 1:12-14, Paul reminds his friends in Philippi that he was a prisoner when he wrote this letter. Even though his location and circumstances are never explicitly stated, most Biblical scholar believe that Paul was under house arrest in Rome, waiting for his trial before the Emperor for a crime that he didn’t commit. The road that led him here was twisted and filled with danger: he faced a lynch mob, attempted assassinations, being held in jail for years, and then a near-fatal trip to Rome that included a shipwreck. Now he was being held for another few years, waiting for a day in court that might never come. And if it did come, he could easily be found guilty and executed. Paul’s life was uncertain and his future was nothing but a question mark. And in spite of that, he was ready to rejoice. How could he do that? Because he knew that in spite of his circumstances, he still belonged to God. He had been redeemed by Christ’s death and resurrection and, even in prison, he still was God’s. It didn’t matter what had happened in the past; it didn’t matter what would happen in the future. Paul was God’s, and for that reason alone, he was ready to rejoice and to call others to join him. That’s the thing about true rejoicing. It’s not a matter of our emotional state. It’s not something that arises from within me. Instead, it’s a response that resonates from what God does for us. It’s not an emotion that needs to be sustained. It’s a way of life that responds to the good things that God does for us. So just rejoice. Rejoice always. Rejoice!